This Thomasville Chest features 6 drawers. Constructed from parawood, an excellent hardwood, with solid sides, reinforced drawer bottoms and full extension ball bearing glides, this collection is guaranteed to last. Its simple clean lines comfortably compliment other existing furniture you already own. More than ever, being environmentally conscious , and responsible, is part of our lives. Manufacturing processes, waste management, use of natural resources and more affect our world and quality of life. We recognize that though home furnishings are a necessity, they too have a positive or negative impact on our environment. 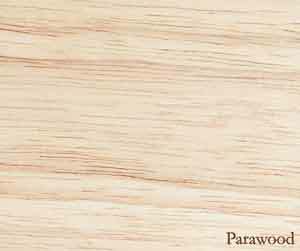 For this reason, as well as the sheer beauty and quality of Parawood, many of our products are proudly crafted in this extremely dense, plantation grown hardwood. Parawood serves our world in more than one way beyond just its wood. It’s a true form of our fully utilizing a natural resource. Parawood is the tree in which latex is produced. For a minimum of 10+ years the Parawood Tree is “tapped” (the same manner syrup is tapped from a maple tree). This is the age in which the tree ceases to produce sufficient quantities of latex and is cut for the manufacturing of furniture. For every tree cut, a new tree is planted as a replacement, harmoniously maintaining natural balance.